The one and only exhibition officially approved by ABBA!The fascination with ABBA is endless, and the expectations are enormous. The ABBAWORLD opening is a major world event, made possible only through intense collaboration with Björn, Benny, Agnetha and Anni-Frid, thus turning ABBAWORLD into the definitive experience of the group, and the only exhibition of its kind officially approved by the members of ABBA. Your audio-guided tour through 25 unique ABBA roomsYour journey through ABBAWORLD will take you through more than 25 different ABBA rooms, letting you experience the phenomenon in a completely unique way. All the way through the exhibition, you will be accompanied by your personal audio guide, and thus you can enjoy it at your own pace. The phenomenon comes aliveThe Swedish super group created a legendary sound that sold close to 400 million records, and they made the whole world take to the dance floor. Their sixth sense for creating hits and their perfection when it came to details took the music, stage costumes and the shows to levels that continue to inspire artists of today. ABBA is once again creating history through this interactive and audio-visual experience of the pop icons. To resurrect the magic of ABBA, ABBAWORLD is using state-of-the-art multimedia technology. The excitement and presence in the time and space of ABBA is recreated in a way no-one thought possible. We welcome you to a mind-blowing journey through the music, memories, and magic of ABBA! 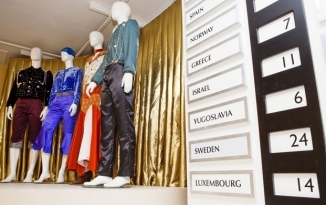 A large number of the ABBA treasures on display that have never been shown before are handpicked and previously owned by the four members of the group. There are also hundreds of other original memorabilia - everything from stage clothes, instruments, theatrical props and personal belongings to unique videos, TV interviews and photos from the astonishing career of the band. In addition, there will be a huge amount of ABBA-related items from band members, Stikkan Andersson’s family, the stage crew, fans and other key people from all around the world. On top of that, both newly recorded and old material that has never been shown before will be presented. Content examples: stage costumes, instruments and personal belongings, gold records and awards, extensive gallery of promotional movies and pictures, exclusive interviews and TV-performance displays, fan-related items, merchandise. ABBA– a place for total interactionThe phenomenon of ABBA will be brought to life in over 25 spectacular environments and with many interactive highlights including ‘Perform with ABBA’, which will allow fans to get up on stage with their idols as part of a stunning 3D holographic illusion. The ‘Tretow MIX Challenge’ gives visitors a chance to mix songs and re-create the ABBA sound while the ‘ABBA Quiz’ which will test the fans’ knowledge. There is also the opportunity to sing along and dance with ABBA, plus a chance for fans to see themselves in an ABBA video. Better still, any interactive activities will be recorded on the entrance ticket, and visitors can access them at any time online onwww.abbaworld.com, allowing the experience to live on and on, just like the music. On entry to ABBAWORLD, guests will have their photograph taken, and this will appear during a number of the interactive features, for example fans will be able to see themselves on ABBA album covers, posters and other iconic pictures. It is no coincidence that ABBAWORLD premiered in London. The UK has a special place in the history of ABBA because it was here that global ABBA fever started with the glorious win of Waterloo at the Eurovision Song Contest in Brighton in 1974. ABBA topped the charts in the UK more times than anywhere else in the world and through the smash hit musical Mamma Mia! and its ten-year success in London, together with the Mamma Mia! movie that became the highest grossing film of all times at the UK box office, a new audience has taken ABBA to their hearts. All interactive features will be recorded onto your ticket and can be accessed via our website www.abbaworld.com from home.